Cushion and stand measure 2' (61cm) long x 1' (30.5cm) wide. The interior is composed of three inches of extra soft foam rubber.When the cushion is parallel with the floor, the top of the cushion is 16"(41cm) above the ground. This has been found to be the ideal height for the restaleg together with ordinary lounge furniture. 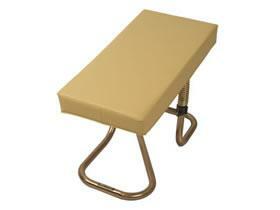 This unique leg rest is the most comfortable footstool you will find.